Life of Jesus, life of Benedict Holy See, is there a Libyan contraddiction? Crucifix, was it defended properly? 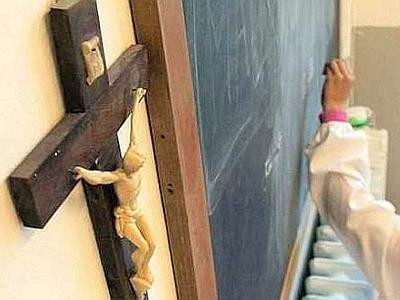 The crucifix exposed in Italian classrooms cannot be considered an «indoctrination». Furthermore, «a crucifix on a wall is an essentially passive symbol and this point is of importance in the Court’s view». Since every country can decide by itself «whether crucifixes should be present in State-school classrooms is, in principle, a matter falling within the margin of appreciation of the respondent State». These are the reasons why the Grand Chambre (Great Chamber) of European Court of Human Rights did not decided in favour of the removal of the crucifix from State-classrooms in Italy. Oile Lautsi, a Finnish naturalized Italian, mother of two children, began with his husband a battle to remove the crucifix from the classrooms her two sons were attending. Her request of removal was rejected by the School Governor, then from the Consiglio di Stato and finally from the Corte di Cassazione, the last degree of judgement in Italy. Oile Lautsi then appealed to the European Court of Human Rights. The first verdict was favorable to Oile Lautsi. But Italian State appealed to the Great Chamber, and the verdict was against Oile Lautsi requests. 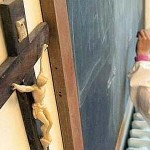 Crucifixes will remain on the wall of Italian classrooms. Is this just an Italian case? Not at all. This judiciary case need to be read on the basis of the principle of so-called positive laity and laicism. Positive laity is intended in order to defend the freedom of everyone in living his own religion. Laicisim believes in a lay State as a unique and supreme principle. This latter view seems to be most developed in Europe. It is one of the fruits of secularization. Religion is «confined» in the big field of the «expressions» of a human being. So religious freedom is going to be considered the same as the freedom of expression. Even the Grand Chambre verdict can yet be a «boomerang». Some Vatican insider don’t hesitate to define Italian State defense at least misguiding. And even Joseph Weiler – expert in international law, Jewish and teacher of Hebraism at New York University, one of the lawyers intervened in the trial as a consultant of the eight countries that associated to Italy in his appeal – criticized the defensive strategy of Italy long time ago. «I did not like – Weiler said – at a first impression, the defensive strategy of the Italian government, which tried to present the crucifix as a symbol that transcends its religious origins and that has a lay meaning. We can surely follow this argument for other hypothesis, as for example The Red Cross, but it is not an appropriate argument on which found a defense strategy in this case». Reading the verdict, one can argue that Weiler argumentation was right. «A European court – the Great Chamber stated – should not be called upon to bankrupt centuries of European tradition. No court, certainly not this Court, should rob the Italians of part of their cultural personality». Anyway, tradition can always change. A religion considered as a tradition and defined a «cultural fact» would be of no value in the future. Nobody can contest or change the verdict of the Great Chamber. But this verdict could be undermined by new verdicts on new trials. Given this defense strategy, many can rightly criticize Catholic Church. For example, the Italian section of the International “left” Catholic organization We are Church, defined «unacceptable – and this was the Italian Episcopal Conference argument – asserting that the refusal of the crucifix in public spaces (schools, courts, hospitals…) would mean relegating Christians and Christianity in the private. It is common known that Christians, maybe more today than in the past, have an adequate weight in the public opinion, especially in Italy». Why did Italy decide to bring on this defensive strategy? And why did Holy See – even it was not formally a party to the case – strongly supported the position taken by Italy? The problem is to be put in a wider perspective. Just think of the defense strategy brought on by Jeffrey Lena, lawyer of the Holy See in the Us, in the John Doe vs. Holy See case. Can the Pope, the cardinals, the high representants of the Holy See be called to testify in a trial or be incriminated? Us Supreme Court declined to take the case. Jeffrey Lena explained that the Court accepted Holy See defense argument, according to the one Holy See cannot be compared to any other corporation in which the “boss” is responsible for the actions of his subordinates. In fact, there was a more simple issue to point out: the Supreme Court declined the case on the basis of a principle of «economicity of justice»: there is no need to make a statement when the statement would be useless. In fact, Lena later explained better is point of view in an interview to National Catholic Register, where he explained that «this was not a decision in favor of the plaintiff or against the Holy See. It was simply a determination that the time was not right to have the case heard by the Supreme Court. It is really not appropriate and indeed misleading, in my opinion, to view the actions of justices as “pro-Catholic” or “anti-Catholic” based on such decisions. I have every confidence that the justices are simply making decisions based upon what cases are appropriate for them to take at this point in time. Much too much is made of the religious composition of the court. It seems to me unseemly for Catholics to celebrate or depend upon the Catholic composition of the court, just as it would be unseemly for Protestants to do so». Why did not the Holy See explain fairly this issue, instead of facing public opinion by underlining topics of little interest for the common people? The matter, for the Catholic Church, is always more in depth, and deals with the skill of instructing and teaching to its priest and officials, and this lack of skilled officials bring to the choice of unskilled attorneys, teachers and so on. The true problem is not the clerlicalism of the world, but clergy secularism. The same clergy that was not able to underline that – as a Vatican observer put it – «not only the crucifix would not be toggled from the walls, but the religious symbols on the wall would be multiplied». Because religious dimension is an important and in-depth part of human being. As the Pope wrote in the last message for the World Day of Peace, «the patrimony of principles and values expressed by an authentic religiosity is a source of enrichment for peoples and their ethos. It speaks directly to the conscience and mind of men and women, it recalls the need for moral conversion, and it encourages the practice of the virtues and a loving approach to others as brothers and sisters, as members of the larger human family». One Response to Crucifix, was it defended properly? I’d really like to be a part of online community where I can get feed-back from other knowledgeable people that share the same interest. If you have any recommendations, please let me know. Appreciate it!